HIPAA is just the beginning to the advantages of patient queuing systems and patient kiosks. Although privacy was the original purpose of touch kiosks for medical facilities, they quickly realized many more benefits. Medical Check In systems start the queuing process from the minute the patient arrives which improves on older methods relying on individuals and paper sign in sheets. Paper sign in sheets rely on the patient writing in the time they arrived but we all know that time is estimated at best. 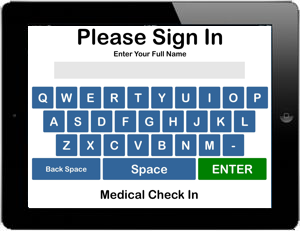 As patients sign in on a patient kiosk, the entry is accurately timestamped automatically and a log is built. Unlike paper methods, entries can be shared across all the computers in the office as an interactive list. This allows departments to see the patient queue directly and react as necessary. If the medical facility has a lobby shared by multiple departments, an electronic patient queue will distribute the workload of respnding to patients. Patient queuing systems will sort patients by department or reason for visit allowing multiple office staff to respond quicker. The benefits of an electronic sign in sheet add up to savings and increased profitability. Improved legibility and accurate time stamping of each patient builds a log that can be used to document office statistics. These valuable reports give insight to patient management and ways to improve a medical facilities efficiency. In the end, management will have valuable documentation and reports to better analyze office performance and staffing needs. Privacy for both business and customer are crucial to patient confidence. A sign in sheet exposes patient names where a patient kiosk collects information without allowing the public to see any information. When patients sign in using a paper sign in sheet, they often estimate, fudge or even lie about the time they arrived. With Medical Check In you get legible names and accurate time stamps every time. Medical Check In automatically sorts and organizes patients into a check list style display on all your computers. Separate your patients with up to 12 departments and 12 reasons per department. The patient list becomes a checklist for staff. The information and timestamps collected by Medical Check In provide valuable documentation and reports. These reports are used to evaluate performance of departments, staff and office down to the hourly increment. Efficiency and Organization add up to faster service. Faster Customer Service leads to more profit. Reducing interruptions saves up to 2 minutes per patient. Saving 2 minutes per patient may not sound big but after 60 patients, that's two hours labor per day. Copyright © Check In Systems Inc.